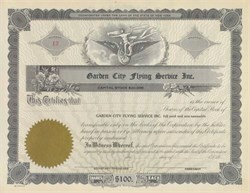 Garden City Flying Service, Inc.
Home > Aviation > Garden City Flying Service, Inc. Beautifully engraved unissued certificate from the Garden City Flying Service, Inc. dated 19--. This historic document has an ornate border around it with a vignette of an allegorical man riding a unicycle with wings. This item has is over 65 years old.